Eurocom Corporation (www.eurocom.com) a developer of long lifespan, fully upgradable Notebooks, high performance Mobile Workstations and Mobile Servers is now supporting the Intel Xeon Processor E5-2690 in its Panther 4.0 Mobile Servers, along with an entire range of Intel Xeon E5 processors. Eurocom’s Panther line of high performance Mobile Servers will be bolstered by the introduction of the Intel Xeon Processor E5-2690 and complete line of Intel LGA2011 processors. 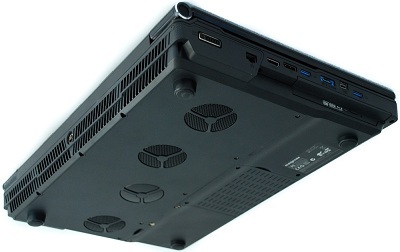 The Panther 4.0 is the world’s first Sandy Bridge-E notebook with a full X79 chipset using the LGA2011 socket. Eurocom Mobile Servers are ideal for professionals and teams who frequently travel yet need access to high performance computing. EUROCOM Panther 4.0 provides server-calibre capabilities with 4 Terabytes of storage with four physical SATA-300 or SATA-600 Solid State, Hybrid or Hard Disk Drives and RAID 0/1/5/10 capability, powered by the Intel XEON E5-2690 with 8-core, 16 threads and running at 2.9 GHz. The EUROCOM Panther 4.0 uses quad channel memory, and enables the Panther 4.0 to initially support up to 32GB of DDR3 1600MHz RAM via four 8GB SODIMM 204 pin modules. “With such massive amounts of RAM, storage, redundancy and processing power available, the Panther 4.0 is a great tool for virtualization and server class environments. This is the ultimate tool for Engineering Companies to combine with our Mobile Workstations to create mobile engineering teams that can be deployed on customers sites. A desktop component-driven mobile server offers many advantages to traditional laptops” said Mark Bialic, Eurocom President. Like its predecessor, the Panther 4.0 has support for four Solid State, Hard Disk or Hybrid storage drives and RAID 0/1/5/10 availability. RAID 0/1/5/10 gives users the ultimate in performance or redundancy. SSD drives in particular will benefit from the use of the SATA 6Gbp/s standard available on 2 ports, eliminating bottlenecks for the fastest SSD drives. “Now supporting Universal Extensible Firmware Interface, the Eurocom Panther 4.0 can surpass the limitations of the 2TB install/boot disc and fully take advantage of its 4 hard drive configuration. Putting 4 x 1TB HDD into a RAID 5 configuration to get a redundant 3TB boot disc. Also worthy of note is the possibility of 4 x 600GB Intel SSD 540 series drives, adding up to 2.4TB or using Seagate’s latest iteration of its Momentus XT hybrid drives, you can get up to 3TB of blazing fast speed” said Mark Bialic. The Panther 4.0 now comes with an Intel® 82579V Gigabit Ethernet port for greater compatibility with modern server operating systems such as Windows Server 2008 R2 and VMware ESXi. Whether through open community support and customized installation isos or via direct support from developer, this allows for easier and better use of a mobile solution for on-location deployment. As of March 23, 2012 Intel has added official driver support for this NIC for Windows* e1c driver as well as updated Linux* e1000e drivers which are used in the open VM community. The Panther 4.0 also sports high speed connectivity and expansion technologies, such as USB 3.0, Firewire 800 (TI X102221ZAY), Expresscard /54 and Intel’s 82579V gigabit LAN. Wireless and Bluetooth 2.1+EDR options are also available. Also included is a backlit keyboard to increase usability in dim lighting conditions.